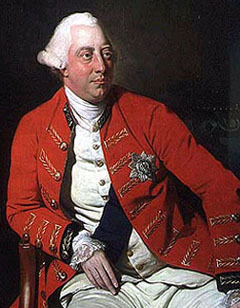 I like King George III. Yes, he was king during the American Revolution. I, of course, had studied about the American Revolution, but had not studied anything about the man who was king at the time. But I write regency romances now, so I must learn all I can about that time period. During his reign the king had bouts with “madness”. The bouts would come and go, until the last 10 years of his reign. From 1810 to 1820 his son became regent–acting in the king’s stead since the king was incapable of fulfilling his duties. So why do I like this man who was proclaimed “mad”? When he was “sane” he had a strong faith, he loved his family, and seemed to be very personable. In one of the King’s excursions, during the hay-harvest, in the neighbourhood of Weymouth, he passed a field where only one woman was at work. His Majesty asked her where the rest of her companions were. The woman answered, they were gone to see the King. “And why did you not go with them? rejoined His Majesty. Isn’t that fascinating? The King came to see you. 9For you know the grace of our Lord Jesus Christ, that though he was rich, yet for your sakes he became poor, so that you through his poverty might become rich. Grace and peace to you from him who is, and who was, and who is to come, and from the seven spirits[a] before his throne, 5and from Jesus Christ, who is the faithful witness, the firstborn from the dead, and the ruler of the kings of the earth. Most days I have nothing to say. Like today. Nothing. The woman can write. And she has something worth reading.